Below is my presentation from Public Sector Effectivenes Conference. Vilnius, October 2013. My name is Audrius Cininas. 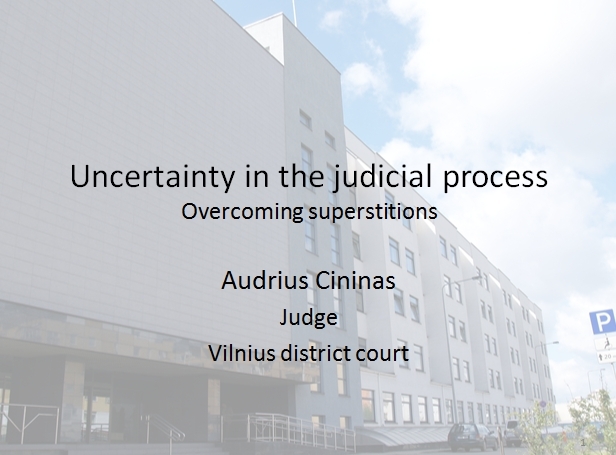 I’m a judge of the division of criminal cases at Vilnius District Court (the biggest court of Lithuania). As you know, I’ll be speaking about the possibilities of planning of regular judge’s activities, reducing of the waste time as well as unpredictability which the judges face in their everyday activities. 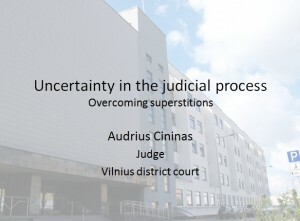 Some superstitions, which are still resilient among the brotherhood of the lawyers as well as politicians, will be discussed too. 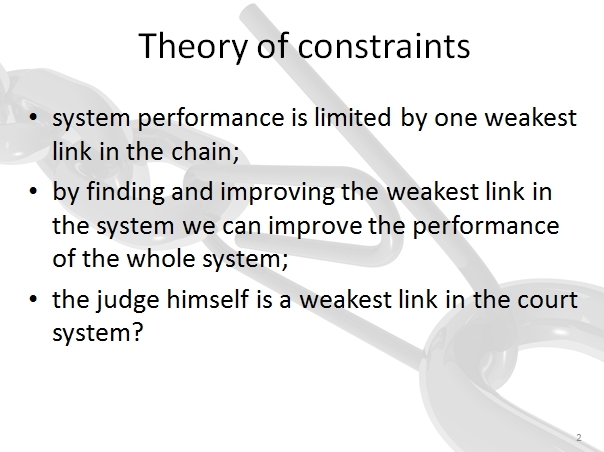 The basic ideas of the presentation are inspired by the theory of constraints (TOC). TOC exploits an idea that the system performance is limited by a single weakest link in it. 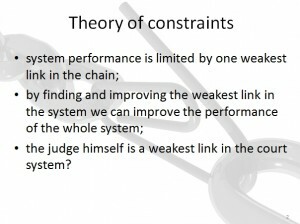 That’s why by finding and improving the weakest link in the system we can improve the performance of the whole system. It has been widely accepted that a judge is considered to be the weakest link of the chain in the court system. This entry was posted in Kita, Pagrindinis and tagged Cininas, Goldratt, judge, theory of constraints, TOC on 2013-12-19 by A.Cininas.